Temple to be worshipped by those born in Moola Nakshatra, those wanting to excel in Music, those who want to have Vamsa Vrithi/Childbirth. Mappedu Singeswarar Temple is at a distance of 50 Km from Chennai and has to be reached by taking a right in Bangalore Highway near Savitha Institution in Chembarambakkam and travelling in Thakkolam road. The Google Map location is as follows. Buses like S591 from T. Nagar to Perambakkam go via Mappedu Bus Stop. Buses from Poonamallee to perambakkam also go via Mappedu. 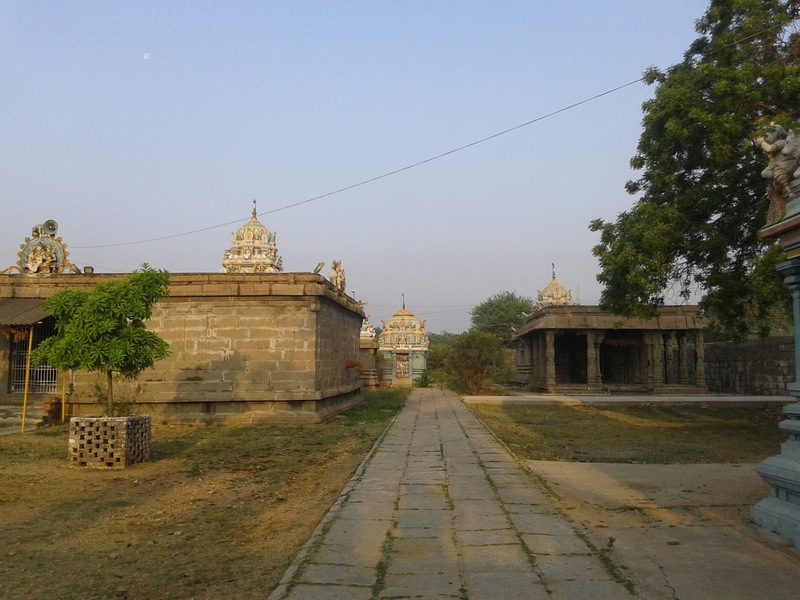 The Brother of Raja Raja Cholan (who built the Famous Thanjavur Brihadeswarar temple), Second Adithya Karikalan has built this large temple spread over 5 acres. 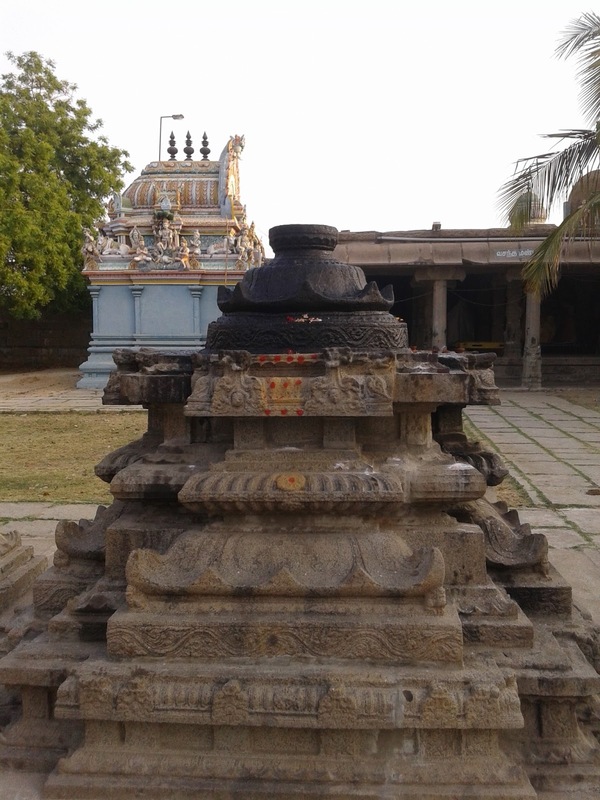 Accordingly the trademark beautiful sculptures of the Chola regime are found in this temple. NavaVyakarana Bali Peedam: Bali Peedam in this Temple is unique and is 6 feet high and is known as Nava Vyakarana Bali Peedam. Agasthiya Vijayam details that Singing Devotional Songs in front of Bali Pedam gives immense blessings to devotees in order to excel in music. When Lord Shiva danced the Ananda Thandavam in Tirualangadu temple, Nandhi Deva known as Singi played the Mridangam-a Drum like instrument. As he was lost in bliss while playing the instrument, he could not see the Thandava or dance of Lord Siva completely. He prayed to Lord Shiva who asked him to come to Meipedu now known as Mappedu and pray to him as Singeswarar. Singi Nandhi deva prayed in this way and Lord Shiva performed the Thandava dance for his devotee Nandhi Deva. 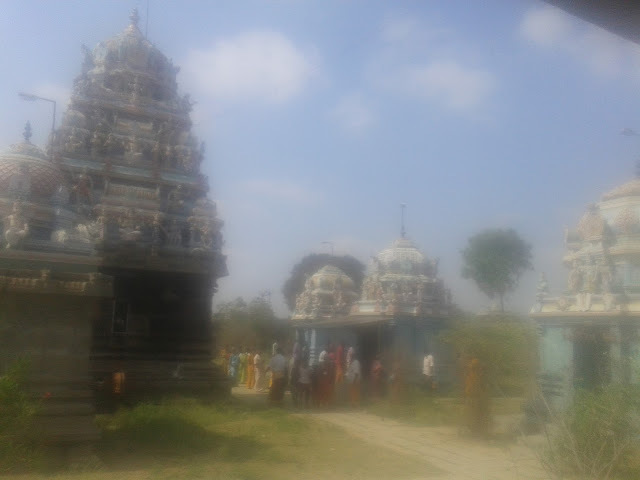 Lord Maha Vishnu also worshipped here after taking the Mohini Avatara. Accordingly Mahavishnu Sannidhi is in the Goshta or behind the Main Temple. 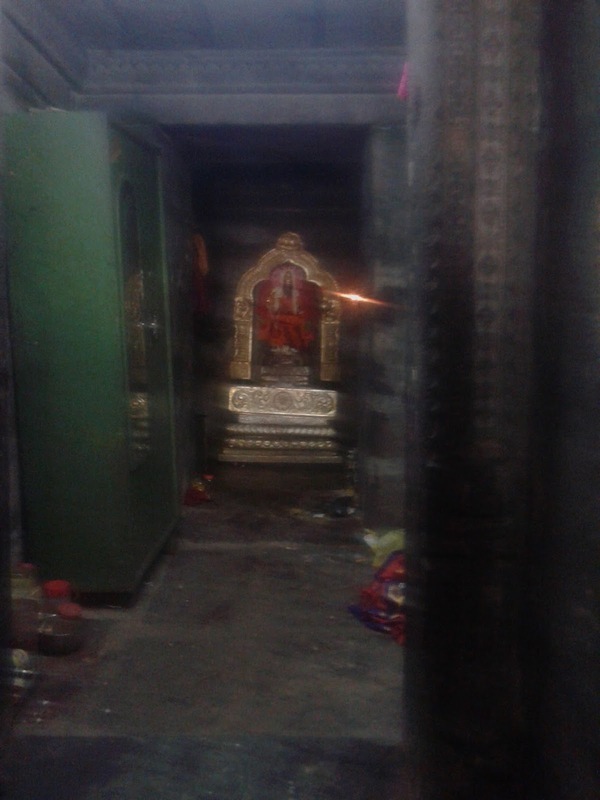 Usually Lingodbava Sannidhi is seen behind in temples. 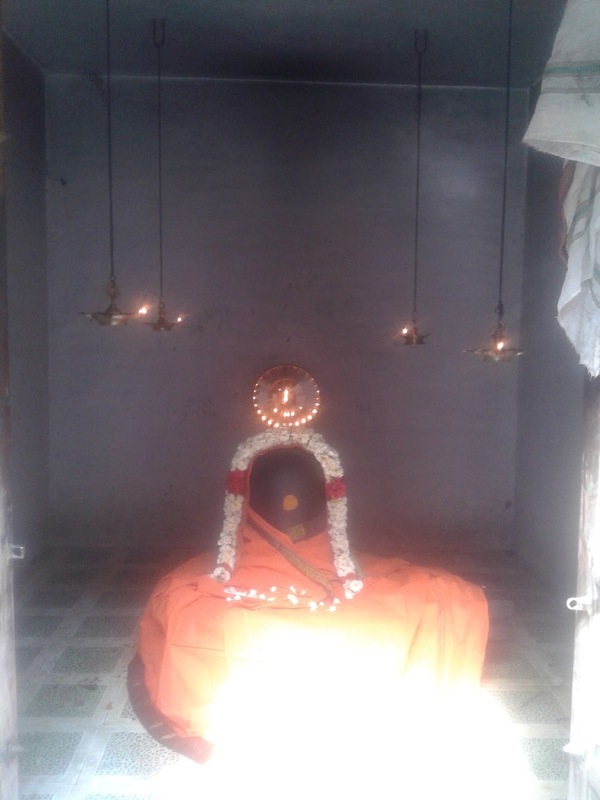 Agasthiya Vijayam, a tamil monthly spiritual magazine details the Significance of Veeryapaleeswarar a unique Form of Lord Shiva. Veeryapaleeswarar Linga is related to the Bikshadana Avatara of Lord Shiva. 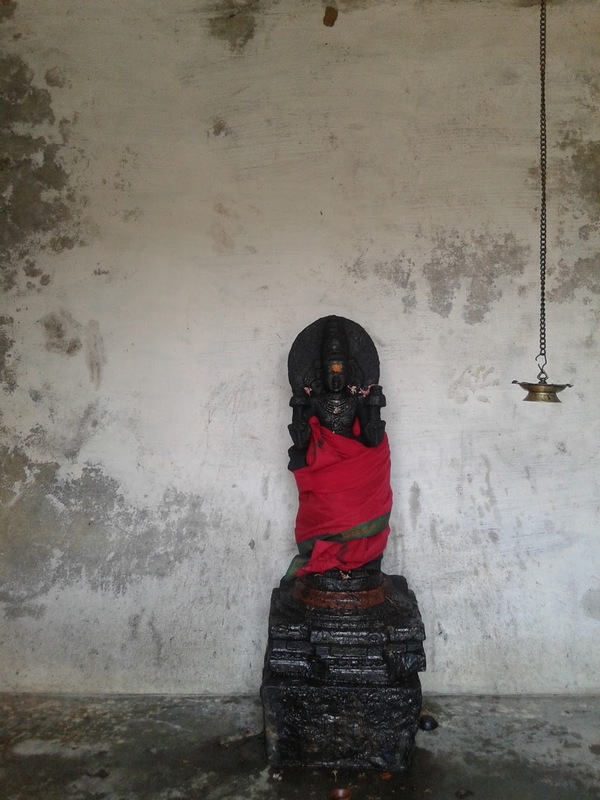 In Darukavana, rishis were haughty about the powers they had gained by performing rituals. Lord Shiva wanted to teach the egoistic rishis a lesson. Shiva took the form of a Young, Handsome Bikshadanar, Mahavishnu took the form of Mohini and went to Darukavana. The wives of the rishis were infatuated with the Handsome form of Lord Shiva and went towards him ignoring the fact that they were wives of rishis. The Angered Rishis performed the Abhichara Yagam which produced bad effects. They directed the snakes, demon, tiger, fire, and drum that came out of the fire against Lord Shiva. Lord Shiva converted the items from Fire as Ornaments. The rishis realised their stupidity and surrendered to the Lord. 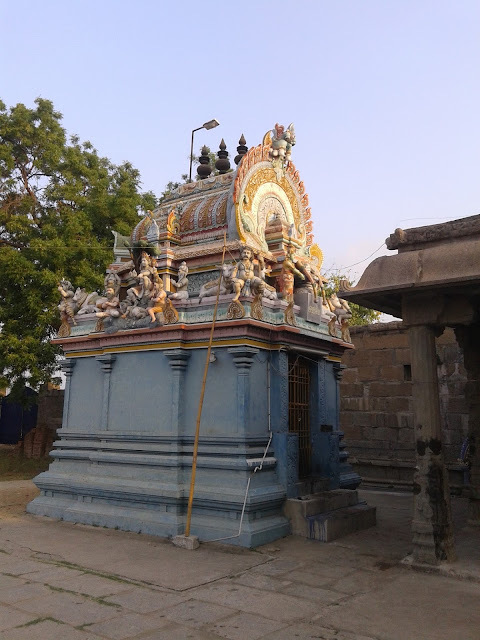 This Unique Veeryapaleeswarar Shiva Roopa is in Mappedu temple. 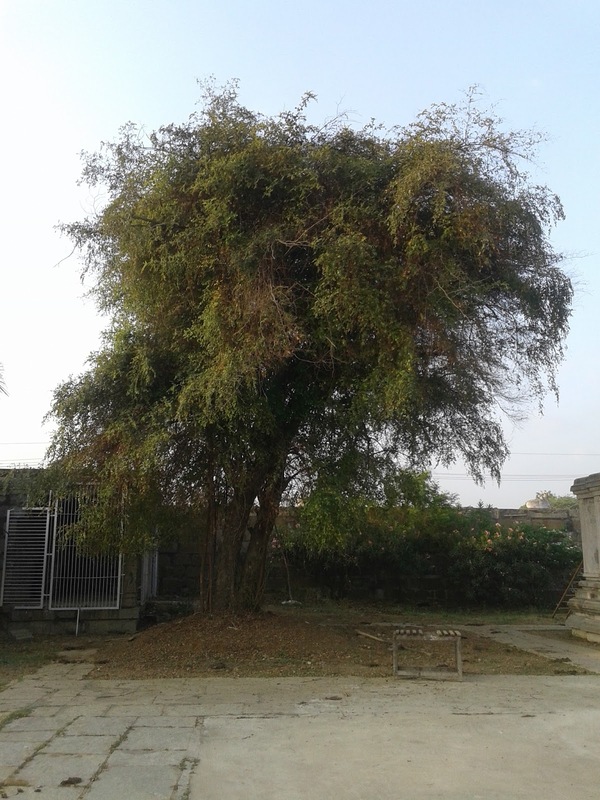 Hence Veeryapaleeswara form of Lord Shiva blesses one to have Vamsa Vrithi or Childbirth and fertility problems if any are sorted out. 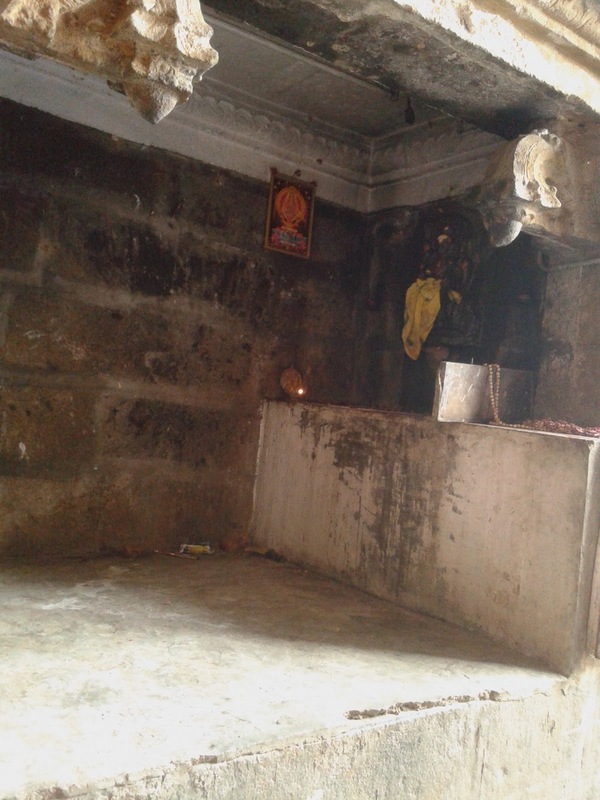 Agasthiya Vijayam also details that Lord Dasaratha performed pooja here and was blessed with a child like Lord Rama. Sudabudha Maharishi did penance here and was blessed with the Darshan of Lord Dakshinamoorty. 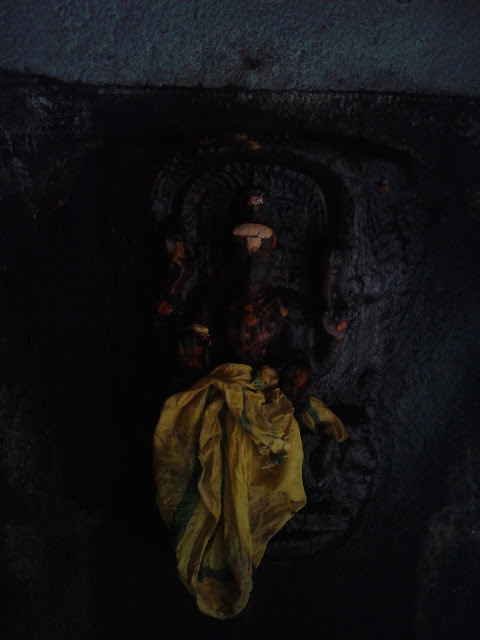 Accordingly there is a unique Sannidhi of Dakshinamurthy under the Raja Gopuram/Main Entrance of Temple. 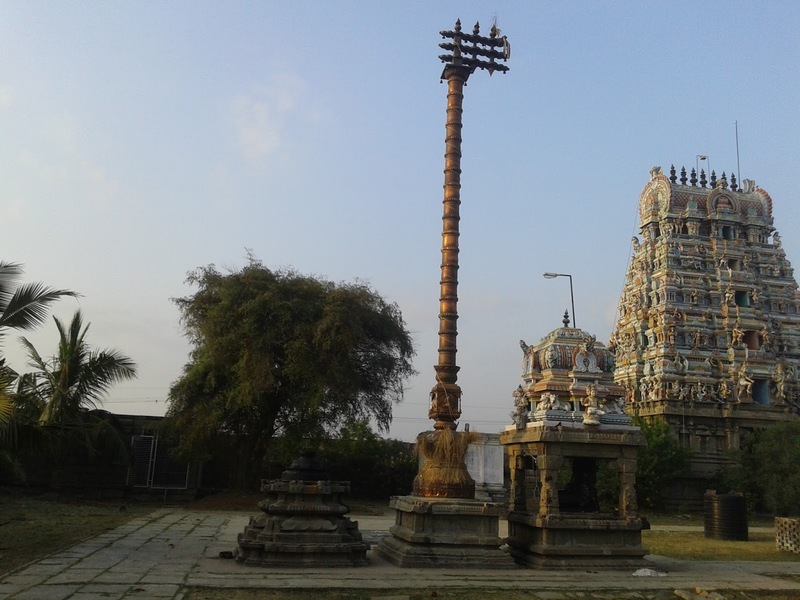 Usually the Dakshinamoorty is seen in the Prakaram or surroundings of temple. 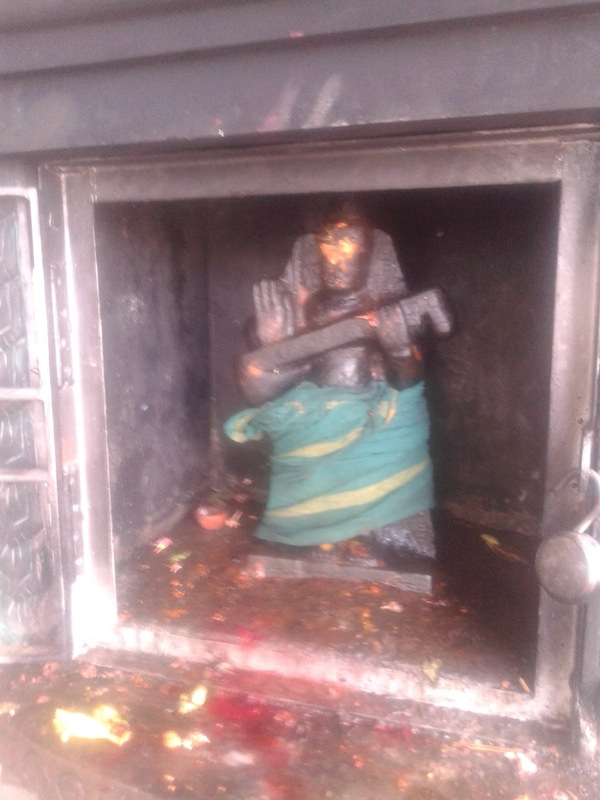 Here Lord Hanuman is seen with a veena and blesses devotees to excel in music.